The best time to influence a child is about 9 months before birth. The overdriven sound of a valve power amplifier is highly desirable, with many different output stage designs to produce the variety of trademark sounds heard on modern recordings. The only problem is that a valve power amplifier is only capable of producing this sound at one volume (usually, fairly loud!). Dummy speaker loads (the good ones are not just resistive, they need to simulate the reactive load of a speaker) allow a player to use one amplifier in a variety of playing situations and styles by running the amplifier at the desired level, and using the dummy load to regulate the volume level. Another option for the playing musician is to use a variety of amplifiers, however, this approach appeals only to rare wealthy musicians. Leo Fender's classic early designs used 6V6 tubes, and later, the higher powered 6L6's. This gave a characteristic full and punchy sound, suitable for many styles of the day, and later. Steel and country players like the chime-like clean sounds, and blues players were quick to discover the classic way it breaks up when pushed hard. At really high overdrive, though, the sound becomes quite dirty, with bass in particular sounding flabby. Marshall designs started as Fender copies, but soon switched to EL34 output tubes, possibly for local supply reasons. Anyway, the rest is history. These tubes exhibit a softer overdrive transition, and maintain clarity even at high overdrive levels. They also have a limited middle response, giving rise to the famous Marshall crunch sound. The lower powered EL84 tubes have similar characteristics. Vox AC30 (and the more popular top boost model) uses a Class AB power amplifier design, with the valves biased "hot", so while this operates in class A at lower levels, it is really a class AB design. There's no negative feedback in the power amp either, so this gives a different sound, often described as a sweeter overdrive. Listen to Brian May's sounds for plenty of good examples. The Fender and Marshall designs use class AB for their output designs, biased with the valves almost off with no signal. This is more efficient (more watts per tube), and better for tube life. When you play, tubes take turns handling each half of the signal. This leads to some minor distortion as the tubes cross over which is all but eliminated with the negative feedback. Class A designs are rare in medium to high power guitar amps, but true class A has the tubes operating at half power with no signal applied. When you play, the tube fluctuates between full and no power, so there is no switching to add unwanted distortion. This is a very superficial explanation; please read elsewhere on the Internet for more detailed descriptions. Boutique amplifier builders offer composite designs, offering characteristics of all designs. This can be done dynamically (by responding to picking strength and volume settings), or with various switching schemes. Mesa Boogie has built it excellent reputation for tube preamp overdrive and tone shaping designs, used in conjunction with high quality tube power amplifiers. For most of us, we can use a wide range of effective stomp boxes for our overdrive and distortion sounds. There is much history on the attempts to recreate the desirable overdrive sounds with various non-linear preamplifier designs. When a player tests one of these devices, the first impression is usually formed on the type of overdrive character and tone produced, and players will be looking for sufficient flexibility in the controls to tailor this to their personal tastes. The basic types of overdrive are generally classified as soft and hard clipping. This is usually marketed as "overdrive", where the gain is inversely proportional to the input signal level. This is typically produced either with back to back silicon signal diodes in the negative feedback path of an op-amp, or with germanium diodes or LEDs back to back in a shunt to ground. Different guitar pickup combinations produce recognisable signature sounds of the instrument used. By its nature, overdrive will mask this timbre to some extent, however, many musical styles prefer to retain as much of the original character as possible. Again, by its nature, overdrive will produce inter-modulation distortion when two or more notes are played together. For just two notes played, inter-modulation distortion produces an additional note with a frequency of the difference between the original two notes. For chords, where up to 6 notes are played, the combinations of note pairs can produce an unrecognisable mess of distortion. On the other hand, this is actually desirable in musical styles which use mainly power chords, because in this case, the inter-modulation distortion adds a note which is tune with the chord. For other styles, where a player may want to hold one note and bend (change the pitch of) another, a slurring bass note occurs which is generally quite undesirable. This can be minimised to some extent by limiting bass response. One of the key desirable features of overdrive is the sustain produced, however, too much sustain will destroy the dynamics. Players will also want to use the overdrive sound for single note solo work, and be able to turn down their guitar volume (effectively reducing the gain of the overdrive preamplifier) to clean up the sound for chord work. Some designs are better than others in this ability to compromise sustain and dynamics. Designs that give the impression of 'switching' from overdrive to clean as a note fades are usually perceived as sounding unnatural. Because preamplifiers are generally connected between the guitar and the amplifier tone circuit, there is no pickup equalisation to compensate for reduced treble response. Consequently, it is usual to limit the bass response before the overdrive section. While it would be logical to boost it after the circuit, this makes the inter-modulation distortion more noticeable, so this is often not done. The overdrive circuit itself adds higher frequency components to the sound simply because the overdrive circuit is non-linear. These must be cut to preserve some tone similarity with the unprocessed sound, and to also remove unwanted high frequency components. Most players prefer this to be adjustable, to suit their own tastes. Although labelled as distortion, this is a soft clipping device, using germanium diodes. It's a good example of how little you need for a good basic sound. You could easily swap (or switch) these diodes to silicon types for hard clipping. Not necessarily the next pedal chronologically, but look at how similar this design is. It uses 2 silicon diodes for symmetrical hard clipping. I would also expect that at high gain settings, the IC also clips to the supply rails. No discussion on overdrive pedals is complete without looking at the Ibanez Tube Screamer. There have been several minor variations of the pedal released by Ibanez, and a larger number of variations sold by boutique pedal manufacturers. As our guitar heroes die, it seems the equipment they used sometimes takes on a mythical status. In my opinion, this is the case with the genuinely legendary Stevie Ray Vaughan and the Tube Screamer. This results in some silly prices for original pedals, and a lively market to convert different pedals to Stevie's model. Nevertheless, the green Ibanez box is a very smooth sounding pedal that retains the guitar timbre well, and for that reason works well with single coil guitars. There is not an enormous amount of drive available, and the tone control is subtle. Like many overdrive pedals, there is some middle boost, caused by the bass cut before overdrive, and treble cut afterwards. Another common use for these pedals is as a middle booster to drive a valve amplifier harder. This is done by setting little or no drive, but with the level set high. In the schematic, you can see two silicon diodes, back to back, in the negative feedback path of an op-amp. This arrangement gives symmetrical soft-clipping. These were originally sold without the tone control. The design is nearly identical to the Ibanez Tube Screamer with 2 important changes. More boost is available, but is partly offset by using 2 diodes in one direction and only one in the other. 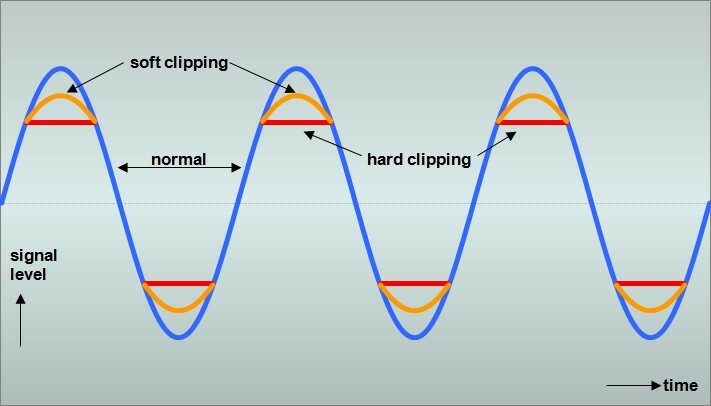 This produces asymmetrical soft clipping, meaning that one side of the waveform is clipped more severely than the other. A more common implementation of asymmetrical clipping is to use 2 silicon diodes, with a germanium diode in series with one of them. There is lively debate on the Internet about whether this sounds more natural, and whether it better emulates some asymmetric valve phase splitter designs. In any case, I think it does add a little character, and therefore suits humbucker guitars well. These three pedals were released in the early 90's, and use different clipping and tone shaping techniques to deliver different sounds. The Blues Breaker uses silicon diodes in series with a resistor, in the op-amp feedback path for very soft clipping. It's therefore a very subtle pedal, with warm sounds at low to medium overdrive, but can sound a little fuzzy at high gain. Retention of guitar timbre and dynamics is good, and intermodulation (read above) is acceptable. The Drive Master uses LEDs shunting to ground for symmetrical soft clipping. I like this pedal for its howling Marshall stack-like qualities with single note solos and power chords. Dynamics are good at high drive levels, retention of timbre is excellent, but intermodulation is a problem for anything but simple chord work. The Shred Master is not quite the animal its name implies. It uses silicon diodes shunting the signal to ground, for symmetrical hard clipping. Bass and treble controls, and a contour control offering middle boost and cut sounds give a wide range of usable sounds, although I'm not convinced shred is one of them. Retention of dynamics is good, intermodulation is OK, and retention of timbre is good at low drive settings. Here's a circuit that combines many desirable features. Feel free to experiment with the component values. For example, using lower value capacitors around the tone control will give a brighter sound, and vice versa. The capacitor on the left sets the tone at fully clockwise, while the one on the right sets the minimum tone sound. This circuit has been updated for 2002. A buffer mode switch has been added - see the notes below (normally you would just wire this permanently the way you want to use it. Also, thanks to Todd Modjeski who pointed a correction required for the input over-voltage protection. The Op Amp should be any dual low noise device, such as a TL072. The 1N4148 diodes can be any small signal silicon diodes. The 1N4004 diodes can be any 1 amp rectifier diodes (eg 1N4007 is OK also). The input buffer transistor should be any high gain low noise device, such as a BC549. The top left portion of this circuit supplies 9V power and 4.5V bias to the rest of the circuit. Connect all the 9V points together, and connect all the 4.5V points together.